Hello, my name is Uljana [ool-yA-na], welcome to all of you who are visiting my page! My blog is here to inspire you and it’s also a place where I can share my creations with you! I learned to crochet at primary school as it was part of the curriculum at the time. It was a bit of a chore and more of a compulsory school lesson rather than a creative hobby. I didn’t pick up my hooks again until several years later. 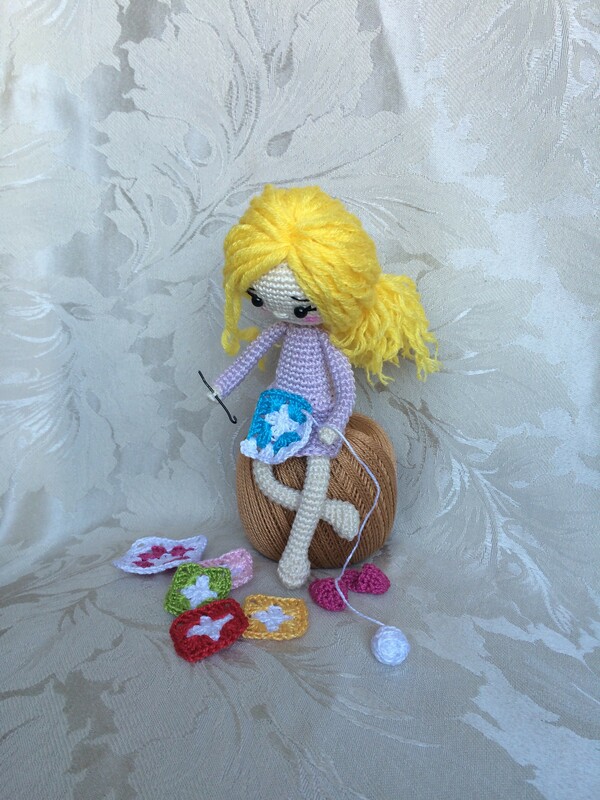 My sister-in-law had joined a crochet group and showed me what she had been making, this inspired me to dig out my yarn and begin designing and creating the trinkets you can see on my social media accounts. I am often asked how long it takes me to make various crocheted items. Alongside looking after my two children, I like to crochet in my spare time and I don’t tend to measure how long each piece takes to craft. I enjoy it so much and usually lose track of time. When I crochet, I don’t usually use patterns, I like to crochet freestyle and try to make what I see. The inspiration for my projects comes from everywhere including my kids, the Internet and my own imagination. Please, take a look through my latest posts and creations, preferably with a nice cup of tea and some biscuits! Drop me a line if you have any questions or comments, I’d love to hear from you. i just found your lovely crochet pattern in pinterest and i really love it, thanks a lot for all the creative patterns. i just started to learn crochet about half a year ago, some of the pattern i still not sure how to read. i visited your patterns in ravelry as well, amazing designs, by chance there is any discount ? by the way, may i know where can i get the wooden disc. These are beautiful. Please could I contact you about ordering 5 or 6 different ones as gifts? Your crochet is indescribable! I crochet but, wow! I probably won’t be able to do it, but I’m going to purchase some of your patterns. your angels are beautiful. Can you translate the pattern in german? And send it to my emailadress? I love the little angels, that were great. Which yarn/thread are you going to use? Dmc Petra size 3? I found 2mm hook is to big for that yarn and 1.25mm is to small. Just use any yarn you have at home , with any hook (smaller than recommended), it’s not even necessary to change the hook for the sleigh. The approx size of the mouse is 8cm (if using recommended yarn and hook). This year my mice are even smaller (3-4cm) because I use size 8 cotton thread and 0.75mm hook. We love your crochet designs and wondered if you might be interested in trying some DMC crochet yarns for your projects? Please drop me a line and we can send you some samples to try. LOVE your work…I’m looking for the pattern for the reindeer…can you share or point to where I can find it???? Can I sell finished crocheted items from your pattern? I’ll give credit to you as the pattern designer 🙂 is it okay with you? I love your work and it makes me want to develop my very basic crochet ability. Do you teach, give talks or demonstrate your skill? I have a sewing studio in North Staffordshire and know lots of my students would be delighted to learn from you. I am in Hampshire and not teaching (yet). I’d love to order about 15 of the little pink blowdryer key chains, could you email me with info on how. I came across your work on Facebook and absolutely love it! Is there any way I can purchase some of your creations? If so, please can you email me the details? Do you sell your creations? They are wonderful! I would love to get one of the little girls like my great niece.